Brey's on Seventh offers the complete line of Sunheat products. (also made in Nebraska) and are the safest electric heater on the market. need for any repair, and offer reasonable repair rates. We are also authorized to make factory warranty repairs, which means that any problem during the warranty period is taken care of with no cost to the end user and no claims to file or shipping required. Portable heaters are not intended to heat the entire home, but rather supplement your normal heating system.In many cases these units allow the homeowner to reduce the overall temperature in the home and keep the most occupied area comfortable on those cold winter evenings. The units have casters so that they can be easily moved from room to room as your heating needs change. Portable space heaters are an effective way to heat a room or section of the home without raising the temperature in the entire home, this saves you energy cost. Sunheat is a soft heat that can’t cause a fire. All units use standard home outlets (grounded outlets are needed) which means you don’t need an electrician to install a dedicated outlet for the heater. The Sunheat unit has a plenum insides that heats up before the fan starts so there are no cold drafts at start-up. The fan on the Sunheat is whisper quiet and gently moves the heated air out the front while pulling the cooler air in the back of the unit. Each Sunheat has a washable filter to capture dust so that it is not sent through the heater and back into the room. The Sunheat has a heavy duty line voltage thermostat to cycle the unit off and on. Another important part of the Sunheat line is the Mountainaire Air Purification System. This unit, redesigned from the original offering, offers air filtration through a series of filters as well as an ozone generator to cleanse the air. This unit can be used all year round to rid the home of odors and allergens and is very low cost to operate. 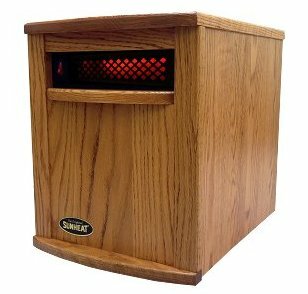 If you have seasonal allergies or asthma you really should consider this unit for your home. We offer several cabinet colors in the standard heaters (SH1500) as well as a fireplace model that features the same heating design along with an attractive display suggesting a wood burning fireplace. We also have the Mountainaire Air Purification System in stock.